Original Gorilla Glue #4 S1 is the original Gorilla Glue straight from the source! One of the most-popular strains of today, this multi-award winning and super-potent hybrid with her crazy-high THC content of up to 30% gives a spectacular high that is euphoric and relaxing. Dark Horse Genetics has partnered with GG Strains to bring you the real deal with these 100% genuine genetics! The spectacularly potent Original Gorilla Glue #4 was until recently not widely available beyond the US west coast where the strain had been discovered. Now, these fine seeds made their way to Europe to the delight of many cannabis enthusiasts. The parent plants for the Original Gorilla Glue #4 S1 are a Chem’s Sister, a Sour Dubb and a Chocolate Diesel although the discovery of the strain itself was a happy accident. Joesy Whales and Lonie Watie, two cannabis breeders from the USA discovered the strain after Joesy’s Chem Sis accidently hermied and pollinated a Sour Dubb. When Joesy tossed the strain out, Lonie had the divine foresight that he kept some seeds which he later germinated out of sheer curiosity. Little did the guys know back then that the seedling making its way through the soil would become one of the most popular strains in recent history! The Original Gorilla Glue #4 S1, once she had been discovered and then thoroughly tested and tasted shines with a plethora of outstanding characteristics that explain her immense popularity and the many awards that the strain already won. One of the most noteworthy qualities of Original Gorilla Glue #4 S1 is her extreme THC content that measures from 24-26% on average with some phenos having weighted in with as much as 30%, making her one of the most potent hybrids. But despite being so powerful, she gives a greatly balanced high that isn't too one-sided but very relaxing and uplifting at the same time. 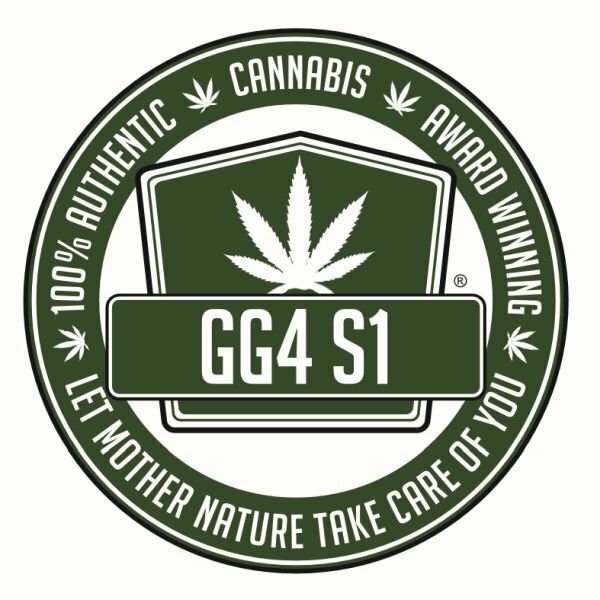 Original Gorilla Glue #4 S1 can be a great smoke for chilling and stress relief and also makes a good mood-lifter thanks to her happy and cheerful effect when you smoke her. 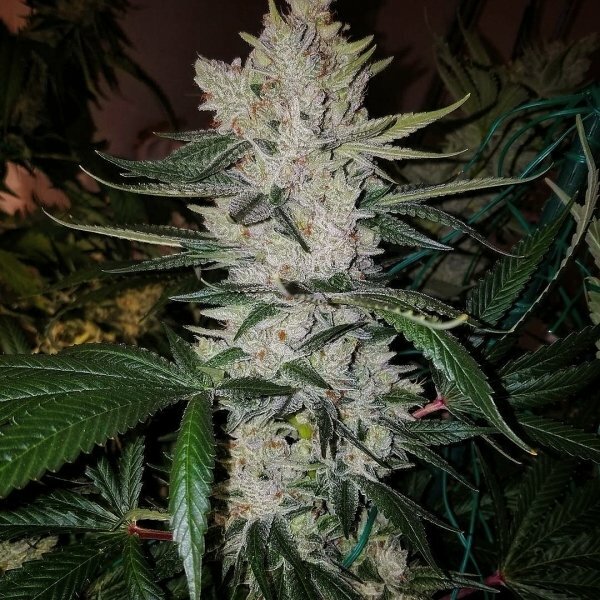 Because of her immense potency, Original Gorilla Glue #4 S1 can also be a good strain for medicinal users who want a strong herb that can help with the symptoms of health conditions like chronic pains or insomnia. With her uplifting effect, she is in particular well-suited for those who suffer from depression and other mood disorders. Original Gorilla Glue #4 S1 is a spectacular strain for many reasons although her yields are more in the medium/moderate range. She is easy to grow and makes a good plant that you can cultivate indoors or outdoors without much trouble. With a flowering time of 9 weeks, she keeps the wait for harvest reasonable as well. Yet another other highlight of the strain, aside from her spectacular effect and her sheer potency is that she shines with very good resin production where cannabis lore tells us that this is the reason for the strain’s name: The two breeders who discovered her kept sticking to everything because of the generous amount of thick and sticky resin that she produces. The Original Gorilla Glue #4 S1 delights with a very pleasant taste that combines earthy and sweet tones with perfectly complimenting notes of lemon and pine. She makes for a mouth-watering and very satisfying smoke that even spoiled cannabis connoisseurs will love. Original Gorilla Glue #4 S1 won multiple awards including both the Michigan and Los Angeles Cannabis Cups in 2014 as well as the High Times Jamaican World Cup. The seeds of the Original Gorilla Glue #4 S1 are now finally available in Europe in a super-limited release! If you’re a cannabis enthusiast make sure you grow this outstanding strain!